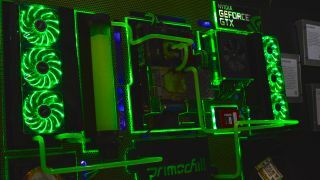 Even though Nvidia is one of the top producers of graphics cards and processors, plus the Nvidia Shield, the successful company still manages to make time for the everyday hobbyists. Nvidia set up at Maker Faire 2014 again but with a little less fanfare compared to last year where the theme involved attendees joining in PC modding workshops. More dev-heavy this time, Nvidia showed up to show off the Jetson TK1 software development kit. Based on the Tegra K1 processor we saw at CES 2014, the Jetson TK1 is a new logic board targeted for use in computer vision and robotics. It can also enable embedded applications that utilize computer vision capabilities in the areas of healthcare, automotive, security and defense. The Jetson TK1 has even more processing power than the one found in the Shield so it's possible we may see a next-gen handheld from Nvidia with a version of the TK1 guts in the future. For more on the Jetson TK1, check out our video below where we spoke with Nvidia's Product Manager for Embedded Applications, Jesse Clayton. Stay tuned for more from Nvidia when we hit E3 in June. Perhaps we actually will see (or hear about) a next-gen Shield? Pebble was also on hand to mingle with Makers this year!